Best of collections are great, because you get variety and everything is supposed to be good.Â When it works out like that, everything is fantastic.Â Now there’s a truly fantastic best-of collection and it’s ready for you right now. 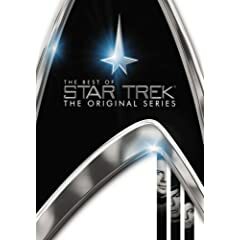 Starting this May 12th, now available on DVD from CBS DVD and Paramount Studios Home Entertainment comes the definitive collection of the best episodes from the ultimate science fiction television show.Â The Best Of Star Trek â€“ The Original Series is ready to beam you up into a place of Vulcans, Klingons, Romulans and a whole lot more.Â Bring home this wonderful collection of four episodes today and you won’t ever regret it. The impact that Star Trek â€“ The Original Series, best known to true fans as TOS, had on both television and science fiction cannot be overstated.Â To try and illustrate why this is the case, you are presented with four episodes that best show what this series was all about.Â In â€œThey City On The Edge Of Forever,â€ Spock, McCoy and Kirk are sucked through the Guardian Of Forever into the 1930s, where Kirk promptly falls in love with a woman destined to die.Â He attempts to save her but learns that doing so would destroy his entire future.Â What choice does he have now?Â In â€œThe Trouble With Tribbles,â€ the USS Enterprise is carrying a shipment of quadro-triticale (a grain) to help feed a colony that the Klingons are trying to destroy.Â Uhura brings a furry Tribble on board but they quickly overrun the ship and discover a nefarious plot.Â In â€œBalance Of Terror,â€ the Federation comes face to face with the Romulans for the first time and that face looks terrifyingly similar.Â And in â€œAmok Time,â€ Spock is suffering because it has become time for his ritual of mating to pass.Â In order to help his friend, Kirk diverts the ship to Vulcan where Spock will fight a champion to mate with a female Vulcan.Â Yet when Kirk is chosen to fight Spock, is there any way out alive? The special features included in this DVD are English, Spanish and Portuguese subtitles.Â But do you know why you don’t need special features?Â Six words – William Shatner, Leonard Nimoy and DeForest Kelley.Â Not to mention four of the best TOS episodes ever made. I cannot overstate just how excellently these four episodes were chosen.Â I might have chosen to replace â€œThe Trouble With Tribblesâ€ with â€œSpace Seed,â€ an episode I have long contended is one of the best of the series.Â However, most laymen are most familiar with â€œTribbles,â€ so I understand why it’s included.Â â€œThe City On The Edge Of Foreverâ€ give us one of the best interactions between the three parts of humanity that the writers used Kirk, Spock and McCoy to illustrate â€“ the conscience, the logical mind and the humanistic and moral synthesis between the two.Â Not to mention, some great time travel dilemmas and great 30s sets.Â â€œThe Trouble With Tribblesâ€ sets the stage for some great Klingon battles at later stardates and is a perfect example of the humor and fun that made these original episodes stand out.Â â€œBalance Of Terrorâ€ is famous among Trekkies because it is when we first meet the Romulans face to face and learn their dark secret that even the Vulcans allege they were not aware of.Â This episode is a wonderfully written critique of both jingoism and racism and does a great job dismantling both.Â â€œAmok Timeâ€ is the best episode about Vulcans and has the best fight scene in the whole series.Â You also see a side of Spock you never thought you would without the aid of pon far.Â It’s a delightful four episode collection and nothing from TOS could ever top this. Live your Best life now â€“ bring home this fantastic DVD today. 1 user commented in " Movie Review: The Best Of Star Trek â€“ The Original Series "
As a huge fan myself, I have to say these were not the best episodes of TOS. Although every single book about Star Trek does say City of the Edge of Forever is the best episode ever, I have never liked it. Time travel plots are almost always among the worst of any TV series, comic book, or sci-fi novel. There are notable exceptions (a couple of ST:TNG episodes come to mind and the TV series Quantum Leap), but this episode is not among them. Harlan Ellison is completely overrated. The guy doesn’t even like Star Trek! Amok Time does give a glimpse of Vulcan society, but depends on the premise that Spock miscalculates his ability to withstand the biological mating drives of his people. That’s right, Spock MISCALCULATES. So, to see into his culture, Spock is forced to very artificially act out of character. I can live with the other two choices, but there were still better episodes. And I totally agree with Space Seed, which is perhaps the best of the entire series. I am not good with the episode names, but the one where Kirk gets split in two by the transporter, The Enemy Within (I think) was also one of the best and had the first Vulcan Neck Pinch, which was much more intrinsic to the character of Spock than much of the Amok Time episode. And people knock it, but the Salt Sucker episode was fantastic for a sci-fi adventure. It had everything, a monster, ray guns, the whole shape shifting shtick, and without it, McCoy would never have gotten those nifty medical scanner thingies which were designed to be salt shakers for that episode. And my personal fav… Charlie X. I think most of us started watching Trek as kids and here was a teenager with the ability to do anything and he got live on the Enterprise.